Spark a passion for discovery this Christmas with Science+Nature magazine. Every issue is jam-packed with awe and wonder, taking readers on a voyage from the depths of the oceans to the outer reaches of the cosmos. All Christmas subscriptions include The Week Junior Annual 2019 for less than half the shop price (£8.99). Jam-packed with hundreds of amazing facts, incredible stories, and lots of stuff to draw and do, it’ll be a popular gift to unwrap and get stuck into on Christmas Day! Science+Nature is our explosive new monthly magazine, taking readers on a journey through the universe — igniting a passion for discovery and packed with hands on experiments. Your first payment will include £4.99 for The Week Junior Annual 2019 — that’s less than half the shop price! The ultimate Christmas gift for curious minds! 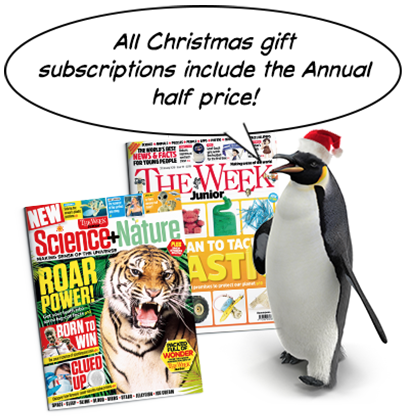 The Week Junior is delivered weekly – and every four weeks you’ll receive Science+Nature included in the same package. Your first payment will include £4.99 for The Week Junior Annual 2019 – that’s less than half the shop price! My granddaughter Rosamund dashes in from school on a Friday afternoon, grabs her latest copy of The Week Junior & disappears for the next 3 hours. She loves this magazine & therefore I've just renewed her subscription for her 10th birthday present. Top mag. My lad loves it, he reads it cover to cover every week — he even has one of the Science+Nature special editions and is saving up for the next one.